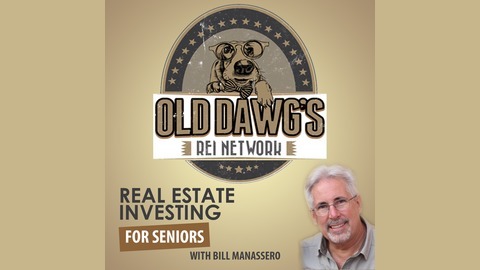 Welcome to the Old Dawg's REI Network where cash flow is king, real estate investing the means, so you can enjoy your retirement dreams! Your host is Bill Manassero who started investing in real estate at the youthful age of 58 years. In this show, he will share his real-life successes and blunders as he seeks his quest to acquire 1,000 doors/units in 6 years. This podcast is a fun, information-packed program that features knowledgeable, engaging guests who will provide practical and easy-to-understand tips on how to succeed in real estate investing. 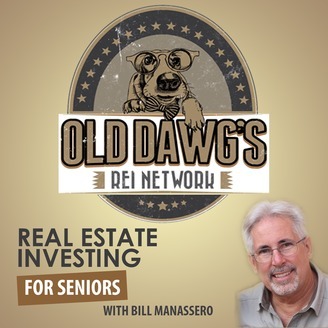 Geared toward 50plusers who are approaching retirement or already there, each episode addresses real estate investing in light of the challenges of retirement living and fixed incomes. Emphasis is on immediate cash flow, short-term strategies, passive income infrastructures and building a legacy for your family’s future. The show guests will include actual real estate investors, as well as industry experts, who share tips on how real estate investing is a viable means for generating additional retirement income now. You’ll hear from real investors doing real deals, making real money and building real wealth in the "perfect storm" of today's real estate arena. Whether you're a beginner, intermediate or advance investor, you'll learn not only the real world knowledge and skills you need today, but also the mindset necessary to grow your real estate portfolio at your pace -- to meet your investment goals. No hype, no sales pitches. Just the information, skills, mindset and insight that will help you succeed. To enjoy podcast episodes not shown here, visit http://www.olddawgsreinetwork.com. So, you’ve finally decided to take the plunge into real estate investing. Your next step is to find an investment property that's increasing in value and will give you great returns. However, in today's seller’s market, good below-market investment properties are hard to find. In today's podcast, Bill explores the world of real estate auctions and some of the great opportunities available for investors with the know how to tap into this valuable resource. IF YOU LIKED THIS PODCAST, we would love if you would go to iTunes and Subscribe, Rate & Review our podcast. This will greatly help in sharing this podcast with others seeking to learn. 298: Who is the Perfect Tenant and Where do You Find Him or Her?